Our Kate Aspen Personalized 9 oz. Stemless Champagne Glass is just right addition to celebrate a milestone birthday. 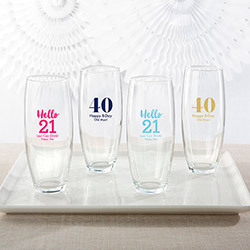 Indulge in a glass of bubbly with your guests and display the details of the event with personalized details. 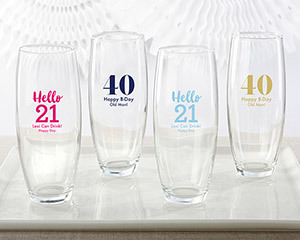 You're forever young at heart with cheery designs to create an adorable keepsake for your guests to enjoy at home. Clear champagne glass is presented without the stem and holds 9 oz. Due to personalization, there is a minimum order of 36 on this item.